The world of e-commerce can often be fast-paced and chaotic. If you don’t have the right elements in place, you can quickly find yourself falling behind, which can lead to customer service issues, poor reviews, or worse–the shuttering of a business. One of the most important elements in e-commerce to nail is your shipping. It is a direct connection to your customer, is loaded with expectations (some of which are completely out of your hands), and is constantly evolving. We’ve put together some shipping best practices for you to implement this year to help take shipping from a headache to something you barely have to think about. Many e-commerce merchants don’t realize just how much they can automate in their shipping practices. Whether it’s carrier selections, packaging, label printing, or user assignments, automating your shipping saves a ton of time and removes the possibility of human error. Choose USPS First Class Package Service for shipments >1 lb. FCPS is by far the most cost-effective way to ship anything under 1 pound. No other services can even come close, despite the major change the USPS made to the pricing tiers this year. Setting up a rule like this makes saving money on lighter packages a no-brainer and takes one more step out of processing your orders. Mark Amazon Prime orders as priority. If you’re doing Seller-Fulfilled Prime on Amazon, you know all about tight turnaround times. Scrolling through your orders to make sure you don’t miss those Prime orders is time-consuming and leaves open the opportunity to miss one or more. Using automation, you can add a tag or category to them to make sure they’re visibly obvious, or so you can sort your orders by category and identify them all at once. This also makes it easier to select all of them for batch printing if you use a shipping platform like ShippingEasy. Apply saved selections to repeat items. Chances are good that you sell the same product or products over and over again. You’re losing valuable time in your day if you’re still entering all the carrier and service selections for those items. Automation lets you set up a rule that looks for particular SKUs or SKU combinations and applies your preferred carrier and service. Then all you have to do is print the label. There are other automation elements that likely don’t require manual setup, but should come standard with whatever shipping solution you’re using. These are things like automatically sending confirmation emails to your customers and sending tracking info to your stores and customers. You’ll find major time savings and fewer mishaps when these elements are automated. Where do the boxes come from that you use to ship your products? Are you purchasing them in bulk? Just using whatever boxes you have around? Not only is this not the most cost-effective way to ship, but it could also end up costing you more to ship items if the packaging isn’t the best size for your products. Each of the major carriers–particularly USPS, FedEx, and UPS–offer free boxes for many of the services they provide. You can order these online and even have them delivered directly to your door! On top of the cost-savings on materials, you may also find that you end up using more cost-effective shipping methods like Priority Mail Flat Rate or Regional Rate when you have that packaging readily available. Flat Rate provides a flat shipping cost based on the package type you choose, regardless of weight (up to 70 lbs) or destination. 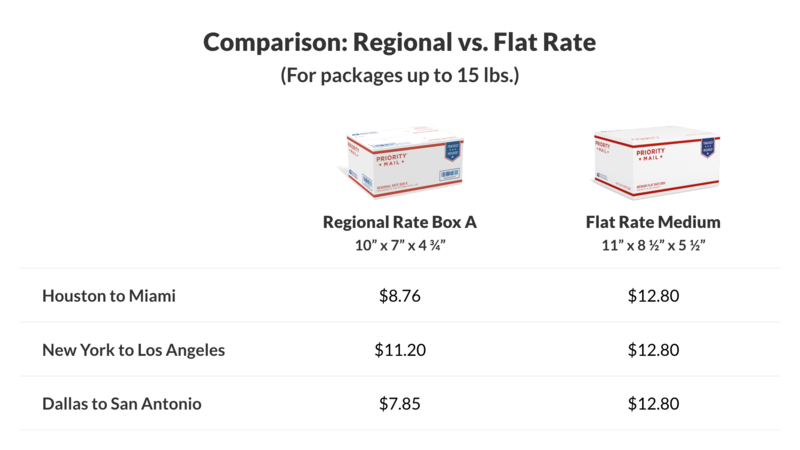 Regional Rate calculates a flat shipping cost based on zones, regardless of weight (up to 20 lbs). You have so much data on your customers in e-commerce. Are you using that to make the experience more personal for them? You should be, and statistics show that they expect you to, as well. At minimum, you should be using their name in your confirmation emails and packing slips. You can take it to the next level by adding personalized notes on the packing slip thanking them for their order or offering a coupon on their next purchase. To take it to the next level, offer product recommendations on your packing slips and in confirmation emails. These recommendations ideally would be based on the product or products they just purchased, but can also be best-sellers, products nearly out of stock (get them before they’re gone), or featured products. When your shipping is optimized, you have more time to focus on other aspects of your business, like inventory management and email marketing. But you shouldn’t have to go to different platforms to manage those. That’s why ShippingEasy offers Inventory Management and Customer Marketing as part of our platform. When you have all these elements working in tandem, your order and customer data feeds seamlessly into your inventory and email marketing efforts. That makes for smarter business management and more resonant email marketing. Ready to take your e-commerce business to the next level. Take the ShippingEasy platform for a spin, FREE for 30 days!